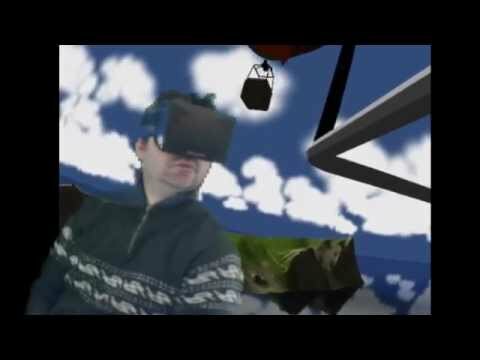 I made my third demo for Oculus Rift in unity - "Air baloon demo". 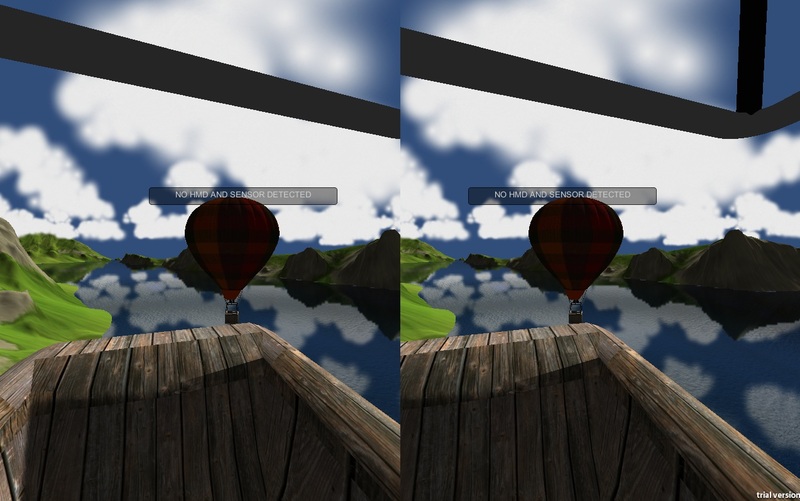 In the demo you can fly in air baloon up in the sky and clouds. There is even one more air baloon flying with you. My dev kit will arrive in june, so i can only read what you experience from my demo. Please give me a feedback. Awesome, thanks for this. Mine shows up in a really bright CGA looking mode, only like 3 colors. Not sure what's going on. i have normal colors on my monitor. Is it only when you plug in the Oculus Rift, or it is CGA on your monitor too? I don't have the rift yet, maybe that's the problem? Very nice. It's relaxing to just lean back and let the hills and bays drift past. 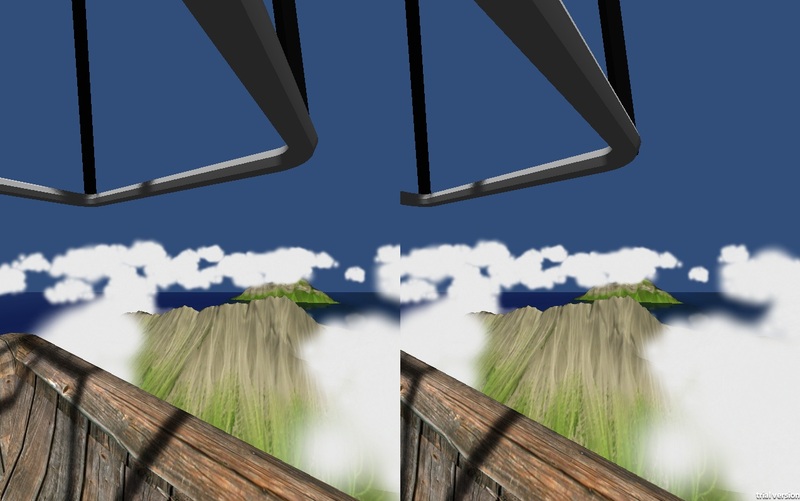 Makes me think that a hot air fly over of some interesting territory (Jurassic Park, Pandora, the ruins of some ancient civilization) might be a very pleasant way to get used to VR without the demands of rapid movement found in most games. After being in this "world" for several trips back and forth, I still had no touch of motion sickness. The file looks corrupted to me. It downloaded, but it was only 27K and didn't extract. Mine downloaded fine and it looks great through the rift! Thanks for sharing! pls try to download one more time. others have no problems with files. cool little demo! thanks for sharing. quick critique: the render dropoff is distracting (when tilting my head the mountains in the distance drop off the imaginary plane). if it could be extended or faded out with fog it would be more immersive! it works, its nice look at the wooden car and the hills. Burst of flame would be cool and fast to make. I know there are many things to improve, but it takes time. I am learning coding only for 2 weeks now, so it takes me extra time to make something. Hydras for propane flame control would be great, for controlling vertical flight. I need to learn how to program the hydras, it's one of my main tasks to do in near future. Check out the Aurora Wager for inspiration on air baloon gameplay. Really nice demo. You can just sit in your chair and look all around quite naturally. Like the helicopter demo, this one also did not cause too much motion sickness. This may be the very first demo I'll be showing my friends because it feels the most natural. How to I stop from "falling out" of the basket? Whenever I start it, without even pressing anything, a second later I fall to the ground. How do I stay in the basket or reset myself back in the basket? (Doubtful that cybereality will see this, but..) The .rar file actually goes to a webpage, not the file itself, so click on the link in his post to go download the actual file. edit: just tried this out (don't have a Rift yet). Looks like it would be neat place to hang out in the Rift for several minutes. i don't know why you have such bug.. sorry. Totally looked up in panic trying to blast more hot air when the balloon suddenly started to fall into the water. I was like, "Oh, man i'm so dead falling at this speed" then after a long pause from the simple bounce back up, I was like "what the hell" and everyone started laughing in the room. You should make a game like "The Aurora Wager", that would be fun. Do you think you could build an OS X version? How did you do the clouds? Most particle-clouds i've seen rotate when tilting the head, but yours stay in place! Maybe someone has an answer? Thanks! The clouds are made from particles. I can't describe all settings how i made them, because i don't have unity installed on my pc, but i remember that i just took defalt particles and played with particle settings so that particles look like clouds. But i made from particles only one cloud and i used spawning script to spawn many clouds on my map. Very relaxing, very peaceful, very comfortable, a very good example of casual gaming on the oculus rift. I'm looking forward to a HD Rift and experiences such as theses in the near future. yay, I'm going on a hot air baloon ride when my Rift arrives! !